I’m not sure I say it enough. My husband is awesome in how supportive he is of my hobby. Tuesday morning he suggested I plan for taking the car to someplace south of Stockholm for a loop like Sunday’s. I could drop him off at work and then pick him up when I was done. I came close to ripping my hair out trying to find a place close to Stockholm that I either hadn’t done or had cycle paths between from one area to another. One small island looked intriguing, but the way off it was an insanely busy road with absolutely no shoulder between traffic and rails. Looking a bit further abroad, I spotted a castle Jens and I visited once. That evening, I commented to my hubby how annoying it was that it was too far a drive. He said it was no further from where he worked in Stockholm than his office was from Uppsala. I should do it if it was what I wanted. Intrigued, I took a closer look. I found a few things to see and in a blink I smiled at a 24-ish mile balloon loop! The rest of the evening and early next morning, I spent sewing extra socks for Loke, prepping maps and packing the little things I take for longer day trips. Jens brought home a bag of malted milk balls for me as well. Not quite as good as Whoppers in the U.S., but tasty. Certainly enough calories to keep me going. I also had some of the hard bread with sour cream and chive filling things. The next morning, off we went around 8 am. Jens drove between home and his office, explaining the best way to get back to the E4 through the insane amount of road reconstruction they’re doing. Parts of Stockholm are being completely rerouted. He fretted a bit about me ending up in the wrong lane of E4 and ending up in Oslo or something too. I assured him I’d be fine. I wasn’t completely sure of it, though at least I wouldn’t be heading into central Stockholm. The idea of driving in Stockholm proper makes my heart race. Overpasses, underpasses, tunnels. You might have to go under and then over an area before finally being able to reach your destination. I’m always impressed with my husband’s ability to navigate what to me feels like the real world equivalent of Escher’s ‘Relativity’. That’s the print with the stairs going every-which-way and strange perspectives. One of my favorites right with ‘The Waterfall’. The traffic jam between my husband’s work and Tullgarn Castle was blissfully brief. Soon, Loke and I were speeding over the E4 with little traffic under mostly cloudy skies which made the day feel even chillier than 54 F. Loke was wound tighter than clock springs. For the hour’s drive between Stockholm and castle he didn’t settle at all. He paced a small circle in his little nook between trike, front seats and back passenger door. Or he stood with his head draped over the front passenger seat in a way reminding me of Snoopy playing vulture. Shortly after 10 am we turned into the parking lot of the castle. This wasn’t the first time we’ve been at Tullgarn. Last year on Easter Weekend, Jens and I drove to it after visiting an old archaeological site on the south western end of Stockholm. It made a nice outing. We found something quite surprising there as well. The board that is in charge of the castle and grounds has worked hard to make the place somewhat ‘green’. I was quite impressed with the system when we visited last April. There had been no smell at all and kind of pretty as long as you didn’t think too hard about what it was. They wisely had the ponds and fountains fenced off for the most part. I parked next to an apple tree and tethered Loke to one of the low limbs. He watched almost anxiously as I started pulling things out of the car. Once the luggage rack was on the ground, the first thing I did was unpack my yellow windbreaker and pull it on. It was down right nippy and with a stiff wind it just went right to the bone. Made me wonder if I should have packed my light woolies. While working on the trike, I heard the honking of geese with another strange sound. Looking up a flock of 30 or so birds passed overhead. The odd noise was when one or more of the geese would do an almost violent mid-air twist of 90 degrees, as if beginning a barrel-roll only to change it’s mind as right itself as abruptly. It was weird to watch. That was only the first flock of many though the rest were smaller. A dozen here. 20 there. A flock or two passed every minute, aiming for the Baltic just beyond the trees. By the time I had the trike together a couple hundred birds must have flown over. The few times the wind stopped whipping the trees, I could hear the cacophony of still many more. Tethering Loke to the trike, I went for a look. It caused a bit of conflict between the furball and I. He, of course, wanting to do a 15-18 mph charge for a mile or so. Me, wanting to look around for photos. I won… barely. Part of the little bay beside the castle grounds was crammed with geese. I couldn’t find a spot to get a clear photo of the most tightly packed part of the group thanks to trees and tall reeds, but I found an area past the trees and over a hedge where I could get a fraction of the feathered mass bobbing on the Baltic wavelets. I can’t begin to guess how many Canadian Geese there were, but I feel safe saying more than a thousand and yet others arriving every minute. Most were further to the right behind the tree at the edge of the photo. I’ve seen large flocks of black birds growing up as a child. Significant flocks of kajas here in Sweden. Once, even a flock of crows that seemed to have no end in the first beginnings of dawn while heading to work early in South Bend, Indiana. I couldn’t remember ever seeing so many geese, Canadian or otherwise, in one place. After finding the geese, I crossed to the other side of the parking, stopping to take a picture of Tullgarn castle/palace. Quite a long history if you click the photo. Loke still tried to run, almost strangling himself on the harness as I went in search of the ponds we’d found last year. Annoyingly, I couldn’t locate them as it all seemed to be trees and parkland right to the waters of the Baltic opposite the geese. As I continued my search, I noticed the trike handled badly. It kept pulling sharply to the left. Stopping to figure it out, I discovered my left front wheel felt mushy. I didn’t look forward to wrestling with a flat as I returned to the car. At least it had happened before I left so I had access to the big pump instead of needing to work with my emergency one. It’s a good little pump, but it takes forever to inflate even a 20″ tire. The tire didn’t seem to flatten any more over the few minutes it took to slowly return to the car. I decided to pump it up and wait 15-20 min to see if it lost pressure. It was easy enough to do since the big pump has a pressure gauge. I filled it to the proper PSI and cleaned out the car a little, fed Loke the sausage patty from the McDonald’s muffin we’d bought him, brushed him a bit. It was during this wait I also discovered I’d managed to leave the duck tape at home. Not good. Granted, I had Loke’s socks from the last trip, but already worn a bit they likely wouldn’t last long. I had 4 new socks, but with only 1 layer of tape, they wouldn’t take much abuse either. After a some agonizing, I decided to go for it any way. I could make the socks last by turning them so he’d run on fresh tape which hopefully would carry him through to the end. Running him on grass and dirt as much as possible would help to. Not sure what made the tire lose over 30 lbs of pressure in 4 days, but it didn’t seem to be a leak. If it was, it was a very, very slow one. I decided to not bother dismantling the wheel to submerge the tube in the bathroom sink. I hitched Loke up, made sure the car was locked and off we went. Loke ran as if his feet had wings for over a quarter mile. The nippy temps and sheer exuberance he has helped propel us to almost 19 mph even on a 2% grade. I helped of course. He yodeled at me when I stopped to take pictures of an old stone barn and an odd tower. It had been set up as a power pole and looked like it had parts on the side which may have been something like a transformer arrangement. Those looked to me like additions. Beyond that, the building was baffling. The footprint wasn’t much more than 3 yards to a side and yet it was two very tall levels. Not enough space to live in even by medieval standards and with such small interior spaces stacked on top of each other, useless for storage. After that, I let Loke race onward. Lucky for him a woman was walking a Giant Schnauzer at the time I saw a mare and foal in a field on the long straight stretch to the main road. The foal was cutely playing with fallen tree branch of all things. It stopped to stare, leafy toy forgotten in its mouth, as we streaked past. We did slow from 18 mph to about 16 as Loke took a glance back at the dog. Knowing how Giant Schnauzers can be, I didn’t want to stick around. Not even for a such an adorable photo as a half grown horse with a big leafy stick in hanging from its mouth. I’ve never seen a Giant Schnauzer other than in photos. Those do not do the size of the dogs justice. He wasn’t quite the size of the Great Dane ‘ponies’ I see at the grocery sometimes, but he looked a close second. I’m glad all he did was watch us whip by. At the head of the shady lane to the castle was a larger road. The sign across from us had distances to various places in each direction, but it was the small green and white bike sign with the word Sverigeleden that made me grin. That why I decided to call those “The Green Signs of Happiness”. Traffic came steadily, but not irritating or overwhelming as on the Drottningholm ride so I had little trouble making the left turn. A nice shoulder helped our way after that. At times it was wide enough for both Loke and the trike with not so much as my mirror lapping over the white line into the car lane. The furry one still loped happily in and out of the patchy sunshine as we made our way out of the ‘string’ of our balloon loop. All that slowed him down were the hills where I couldn’t keep up the speed. My bright yellow windbreaker stayed zipped to my chin. Armor against that wind which came with a vengeance where trees gave way to fields. During that stretch we had an ‘incident’ with a cat. Were he human Loke would be mortified to know I’m telling this to the world. A cat scared him near to death. As we came up to a patch of particularly thick weeds, I noticed something white lurking in the middle of them. How Loke missed it when it was less than 3 feet away, I have no clue. Maybe he was too busy running with his husky smile and the wind was wrong. We’d almost passed when the white and tabby feline of medium size sprang its ambush. Somehow, it briefly caught Loke’s rapidly moving right hind leg though his forward movement pulled it out of the cat’s grasp. Loke yelped as all 4 feet left the ground in a startled jump before leaping into hyperspeed without even looking back, his tail tucked. I twisted around to look back to where the cat sat on the shoulder, looking disappointed. I couldn’t stop laughing. Since I’d been watching when it ‘attacked’, I’d noticed the complete lack of aggression in the cat’s behavior. I have the feeling it grew up with dogs as playmates and it was sad to see this potential new friend running away as in fear for his life. To be absolutely certain, I did stop Loke after most of a mile to make sure he had no scratches. I couldn’t find so much as a spot of blood. I was still laughing. A short time later, we came to the next intersection which was a bit busier and lacking a shoulder. Parallel to it lay a nice cycle path which is often better than the best shoulder a road can offer. I discovered this was slug central. This whole year I’ve seen maybe 3 slugs. There was no way to count how many I dodged on the half mile of path it was to the first church of the day. Trosa Lands (that is the true Swedish name, not a translation) Church was fairly uninspiring as far as Swedish Country churches go. A squat looking bell tower with the entrance to a block-shaped main room. The top of the tower was nice. 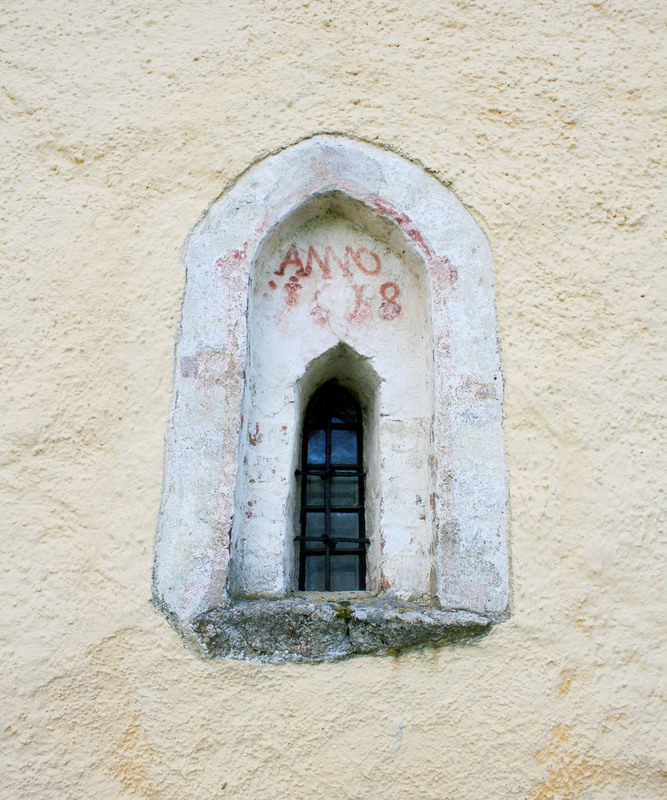 The more interesting things I found was an old window with ‘Anno 1618’ painted above it and a gorgeous wood and iron door into what I think is the sacristy chamber. Yard work was being done and a few people were visiting graves, so I left Loke outside the wall. I didn’t find any runestones. Since the church is what is called a vägkyrka (road church), I tugged on the main door to see if it was open. ‘Road side’ churches are those churches with interest either architecturally or historically, accessible to road travelers and have extended opening hours particularly during the summer months. They have certain requirements to be listed as a road side church. 1) Easily accessible particularly for road users traveling through. 2) Be open for visitors at least 5 hours per day and at least 2 consecutive weeks during June to August. 3) Provide staff for the call and if opportunity exists for guidance. 4) Will provide services. 5) Will have a toilet. Sadly, I seem to have arrived too early for Trosa Lands church to be open. The bathroom was unlocked though. Loke continued to set a brisk pace as we went onward. Most of the time we rolled/jogged along at 8.8 mph and others, we went at 12-13 mph. Fields and woods went by and once a flock of ravens seemed to be meeting in a small cluster of trees. I don’t think I’ve ever seen more than 2 or 3 ravens together at a time. Eight of them flapping around makes for an impressive sight. They’re as large as some hawks. One of my favorite birds aside from raptors. While riding the path, I discovered it wasn’t only the Sverigeleden that claimed the stretch. A yellow sign turned up every now and again with ‘Näckrosleden’ on it. ‘Waterlily trail’. It might mean something other than Waterlilly though. The paved cycle path came to an abrupt end, but the signs (yellow and green) steered me down an small roughly paved lane. Pine needles scattered across it and the right edge of the road was covered with long stretches of vivid green moss. It was a pleasant ride through the shade as one of the few times the sun made an appearance lasting more than 2 minutes. I still hadn’t taken off my windbreaker though it was unzipped below my collarbones at least. Barely 100 yards past the turn, I found my first runestone of the day. It sat right at the road edge as if waiting for me. And during my research I discovered there were two viking age carvings in the immediate area as well. Drat! I took the time there to reluctantly put Loke’s socks on. I started with the used ones. He didn’t argue with me too much about, though each time I fastened the last velcro strip, he gave me an expectant look. I read his expression easily. “So where’s the tasty treat you gave me with the socks last time? ?” I’d forgotten them in the car of course. The road ran between a field on the left and a sharp slope that looked almost like a small cliff on the ride. Less than a mile past the runestone, it was time to chew our way up a significant hill toward what looked like an old (1700’s or so?) fancy stable. It was being used as a feed store, crowded around with so many storage buildings and the like I was uninspired to take a photo. It’s like seeing a castle with a bunch of semi-trucks parked out front. Ruins the image so you don’t even want to take pictures. That’s how I feel any way. Oddly I found no sign of an equally fancy or fancier manor/palace to go with said centuries-old looking stable. The cycle route signs and my maps both indicated I had to cross the busy road there for a smaller one that went south east. I sat at the intersection for almost 10 minutes before getting enough of a break in the constant stream of cars to scurry across. Fields stretched in all directions as I pedaled south. With few hills for most of the way, Loke kept up an easy lope of about 10.5 mph. It would have been faster except for the wind we both pushed against. About half an hour later, Loke and I coasted into Trosa from the east. It was a small town with a slight touristy feel like Sala or Sigtuna. Cycle paths lined most of the streets. Just as we came into the town proper, we surprised a hare. Actually, the poor thing was already a bit startled and freaked out. A dog on a run-line in the backyard of a house had seen us and set to barking, which was what had startled the hare in the front yard. It went to bolt across the street which was toward us, saw Loke and completely panicked. It jumped in the air a few times while running in circles like a drunken bat on speed. Finally, it straightened itself out to shoot across cycle path and road to vanish in hedges. It passed less than 10 feet away from us. I had a tight grip on brakes and Loke’s harness. I waited for Loke to calm down before pressing on. The Sverigeleden signs took me onto a tiny little road with no cycle path. It was tough to wedge a pair of cars in between the buildings that sight right on the pavement’s edge. I actually had to scoot past a road sign and then squeeze in behind it, nearly squashing Loke against a pretty yellow wood building to let some traffic pass. While I waited for the cars to clear, I saw the little road cross from me was forbidden to cars. The sign indicated it was a walking street. Bikes were allowed, but had to respect pedestrians. As soon as I could I scooted across. While pedaling my way between the beautiful old buildings painted in the traditional red with white trim, I spotted the rather elaborate steeple over the rooftops. Assuming it was the church, I looked at my GPS for an idea of how to get over there. That area was a bit of a maze even without the river in between. A very tiny river I might add. Less than 1/3 the width of the one close to our apartment. The church was something of a let down. It was a yellow plastered box capped with a peaked slate roof and completely surrounded by scaffolding. Even without metal bars and wooden planking it wouldn’t have been terribly interesting. I tethered Loke to a tree and went for a stroll around the grounds. The black wooden bell tower perched on its high dome of rock was far more appealing, particularly with the elaborate steeple. Men were hard at work as I looked for runestones or something about the church insisted I get a picture of it in spite of the scaffolding. Nope, not a thing. The men seemed to be adding a fresh yellow wash to the rough plaster. The front doors stood open, but not as an invitation to the public. What I could see of the inside was completely devoid of pews or any other furnishing. Nothing but the rails and planks of yet more scaffolding. The history I found said the church had much of it’s 1700’s character, but what I saw might mean that will have changed once the workmen pack up the tools of their trade and vacate the site. Returning to Loke and the trike, I topped off the furball’s water dish and decided to nibble one of the hard-bread snacks I’d packed. While crunching away, a couple in their mid-50’s or early 60’s passed. They waved and I smiled with a nod of greeting. They took it as an invitation which I didn’t mind at all. The man was very curious about the trike and both were happy to chat. The woman spoke quite quickly and I finally apologized and said I wasn’t very good at Swedish. Immediately, she changed to English which was actually a little worse than my Swedish. She asked where I was from. Alabama of course, she didn’t know, so I gave my fall back answer of “About 2 hours east of New Orleans”. Thanks to Katrina just about everyone in the world knows where New Orleans is. As soon as I said that she grinned and asked if I’d ever been to New Orleans. When I answered yes, she said she had visited the city in the 1970’s. Clearly she had loved it, speaking wistfully about wandering through the French Quarter, the food, the drinks, the music. Her husband stood next to her with a tolerant and affectionate smile. Every now and again, he’d remind her to speak Swedish since she spoke it better and I understood it well enough most of the time. When she mentioned taking a ride in a taxi to look at the mansions, I said it might have been the Garden District. She couldn’t remember what the mansions looked like, but one thing she remembered most was a beautiful iron fence of corn stalks. I laughed and nodded, telling her I’d seen that same fence just 10 years ago when my husband and I took a walking tour of the Garden District. That delighted her to no end. The idea of Katrina ruining such a beautiful city saddened her. I agreed, but said that much of what she remembered, the French Quarter, had survived since it was part of the original founding of the city and therefore had been built on dry, solid land instead of reclaimed. Much else had lost though. They asked how I liked Sweden and if I was enjoying my visit to Trosa. I, of course, love Sweden and said I’d just come through the old streets with the wooden houses and shops which I found lovely. The man asked if I’d been to the harbor yet. It was a definite must-see. After a few more minutes, the man began nudging his wife and we parted. I took a moment to look at my maps, but decided the harbor was too far out of my way. While I didn’t have a definitive time line, I did need to be back at the car by sunset which was roughly 6:30 pm. Getting home before 9 pm would have been nice too. I did decide to look around the old sections of Trosa though. Check another street for more of the wonderful old structures and maybe try to find a path beside the tiny river. I found the old town center which had some shops, even a couple banks and the tourist office which was in a particularly pretty building. I scoured the shopping area for some place that might sell duck tape since I’d already had to turn Loke’s socks. After that brief in-town excursion, we made our way to the main road out of town. Back to a cycle path! Loke still went strong as we ticked over toward mile 12. Me? I felt more like we’d done 25 miles already with the hills and that annoying wind. Heading west, I kept an eye out for a sign indicating the next castle . All I found at roughly the right area were those pointing to a riding school. Juggling my map-books, I decided to go look. I’d actually looked at the castle on-line before starting the ride. Not sure why since I usually want to be surprised, so I knew it had to be there. It was a short half mile jaunt down an arrow straight road. It felt more like 3 miles. Not a tree within half a mile, the breeze was unrelenting. It felt like I’d left a brake locked or something. Even Loke went with his head down and eyes squinted. It was a relief to turn onto a little unpaved lane with trees walling each side. 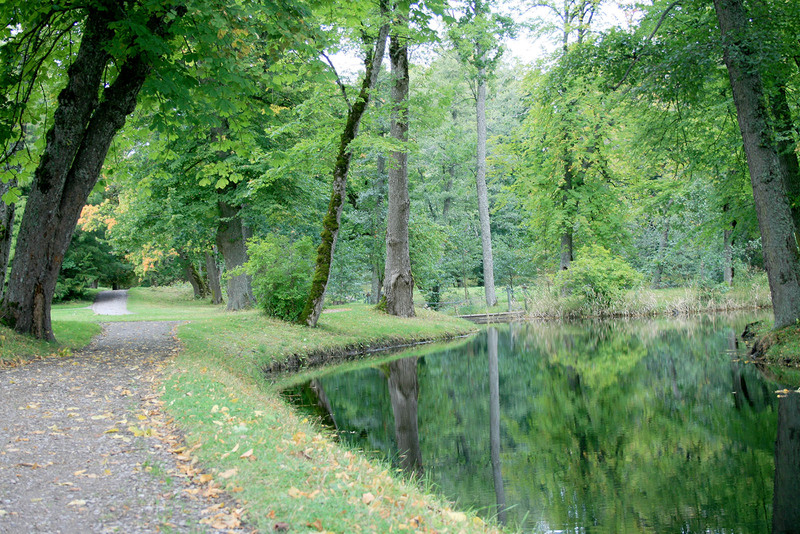 Thureholm Castle was both like and unlike many castles, manors and palaces I’ve seen in Sweden. The ramp leading up to the main building which sat at the back of a forecourt above other buildings. I don’t recall seeing such an arrangement before. Castle photoed, it was a quick glide back to the main road with the cycle path. Even Loke got an extra boost from that wind at our backs. Can’t remember much about the ride between Thureholm (Tureholm, which ever) and Västerljung except one thing. I seemed to be mostly uphill and the smell! Ugh! How I pity the inhabitants. Pig poop! Miles and miles of that reek in my nose as we made our way to the church. Västerljung Church was a nice change from the other churches. A different color plaster and copper roof with a tall steeple on the tower. Okay, so not so different except for the roof and plaster. As I came into view of the church, I had a brief chat with a couple of boys who seemed to be about 9 years old. They asked a couple of questions about the trike while one of them struggled to keep his Swedish Elk Hound puppy from charging Loke. Young as it was (4 month) it didn’t seem to have any puppy friendliness to my white furball. He was nearly big enough to drag the boy like a rag on the end of his leash. He was otherwise a cutie! I looped around to the church parking lot and left Loke in a patch of shady grass. Almost immediately I found Södermanland’s Runestone #Sö40! It mentions figures on the stone, but I didn’t notice any. I guess this means I really should slow down and take a closer look, hmm? Not far past Västerljung, semi-disaster struck. I pedaled down a small country road with a few curves when I discovered a cycle path. I took a look. By now, Loke had worn through the last sections of his last socks so I saw the softer gravel and took off. It was decently well packed and smooth. An extremely well-tended path for it’s remote local and the fact it was gravel. Loke pushed us into a brisk 9.1 mph as we rode between a wall of weeds on the left and a wall of unharvested wheat on the right. I remember feeling surprised at the sight of untouched wheat. Seems rather late in the season for it to be in the field. We zipped past a house, heading down a hill. The next thing I knew we were halfway up the next slope. I had geared down on the rear cogs, but forgot to do the same with the front chain rings. I couldn’t power up in the higher gears. So, I locked the brakes and tried to get out of the trike. The slope was too steep. My now-well-adjusted brakes held fine, but the tires kept slipping on the gravel when I tried to rock up and out. I was stuck. My heart in my mouth, I concluded my only choice was to let the trike roll backwards down the hill some 50-60 feet. I thought about trying to turn the trike as I did, but that could just leave me in a worse predicament. Though I hadn’t touched selector for the front rings, the chain gave a loud ‘POP’ and jumped to the small ring. I made it down to the bottom of the hill. Rather than risk stalling out again, I dragged the trike up (with Loke’s help) until the slope leveled off somewhat. Overheated and furious at myself for the carelessness, I got back on the road as quickly as I could to avoid a replay. The road leveled and Loke wanted to run so I went to put the chain into the second ring. It hiccuped. It bounced. It jerked. It twitched. It wouldn’t stay on the central ring for anything. I let it go back to the lower gears and pedaled. I could see that 2 or three of the teeth had gotten bent. Just as I decided I needed a closer look, I saw a sign for a cultural sight just 100 meters down a dirt road. I pulled into a space of nicely flattened grass and double checked they were bent and not that a pebble had gotten stuck or something silly. Nope bent. A few minutes passed where I just stared at it. I finally decided that, while annoying, it wasn’t the ruin of the ride. I would slow me down certainly. I’d have to pedal more, definitely, but other than that I could manage. Now, if my granny gear ring had bent I’d have been in trouble. I need that little ring to make it up the steeper hills. As long as I could climb the hills, I’d press on. That decided I turned my attention to the site. Right away my attention was caught by small mounds so reading that I’d discovered Silda Burial Mounds. Among some of the oldest burials I’ve come across I think. 40 A.D.? I think there might have been one place with burials in late B.C., but I can’t remember exactly. As you can see from the photos, clouds were thickening by this time. The forecast had warned of chance of rain in the evening and it was coming fast onto 4 pm. I was tired. Battling the wind had taken a lot out of me as had the struggle with the gravel hill of destruction. At least the wind was against us less as we pushed on back toward ‘string’ of our balloon loop. There was another church, but it was a little out of my way nor had I mapped it for some reason so it slipped by as we poddled along in my little chain ring. We lost about 1 mph on our average thanks to it though Loke still did his best to keep it up. We came into the little village of Vagnhärad. I had a bit of confusion through there between trying to see the church steeple I thought had to be there and my map not quite matching what my GPS showed. I did quick bit of research to be sure that the church at Vagnhärad wasn’t a modern place of worship. My mapbook doesn’t discriminate between churches that are centuries old and mere decades or less. It turns out the oldest parts date from the 1100’s. It is nearly identical to Trosa Lands Church! Same square main building. Squat, strong tower. Yellow painted plaster over the stone/brick. Even down to roofs of copper and number of windows! Just slight differences in the roof and steeple and the towers. I had to look for that small difference. I’ll hopefully get to it one day. As I approached a major intersection, the first rain came. Hurriedly, I coasted under the shelter at a gas station to make certain of the weather cover on my camera bag. It didn’t last long and less than 5 minutes later, I hurried across one road to a cycle path following another. The same path I’d jumped onto at the beginning of the loop! I was tired when we reached the road that would finally take us back to the shady lane to the castle. Rain started again and then passed over us as we waited for a break in the cars to scoot over. Sun broke out between the gray as I pushed on as hard as I could with the little chain ring. My right knee was starting to hurt with the strain of keeping a high cadence to keep our speed up. Then something appeared to distract me. 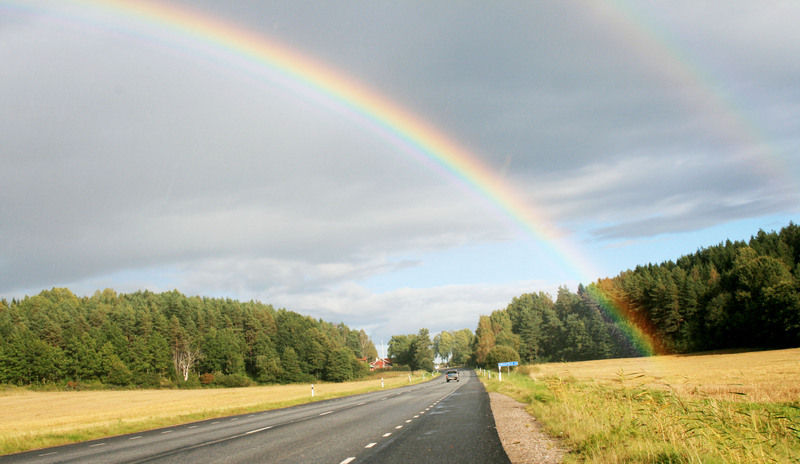 A rainbow arched over the road directly in front of me from one field of wheat stubble to the other. It looked almost close enough to touch. I don’t think I’ve seen an unbroken rainbow touching the ground more than twice in my life. Stopping, I dove for my camera. Rain started to pour down on me as I turned it on. Part of me knew I should put the camera away, but I tried sheltering it as much as I could and snapped a shot. It’s not the full arch of color from field to field, but I did at least catch part of the second rainbow in the upper right of the shot. Beautiful. Cramming the camera back into the bag, I saw something stunning and unpleasant. Heavy, angry clouds the same blue-ish shade of bruises. I honestly went ‘ACK!’, fastened the photo bag shut and took off. Loke didn’t need any excuses to run. He was happy to do so. The rain storm came up fast. Finally I accepted we weren’t going to out run it and stopped to take a bunch of photos to merge. Odd 90+ degree view. I like it! An example of panorama pushed over a 90 degree field of view. Click on the thumbnail for a full view. I think this is my favorite of any photo (or series) taken by me ever. Loke and I still went fast as we could. The rain caught us about the same time we got to the castle road. The light along the tree-lined lane was almost as dim as dusk. Splats of water hit us, but not from overhead. The tree leaves were thick enough to hold back rain a bit. It came in from the side. The wind, hard and steady most of the day, had kicked up to storm force just shoved the rain right at us between the tree trunks. The moderate rain became a torrent as we turned onto the final stretch along the inlet where the geese had bobbed on the waters that morning. It flew at us from a nearly horizontal angle. Loke’s head went down almost to the road, ears flattened as hard as they would go against his head, eyes almost closed and even tail clamped against his haunches. I rode with my head tilted so the bill of my cap protected most of my face. The drops stung and felt like they were on the verge of freezing. I was so glad to see the car. I think Loke was too though I had to leave him tethered to the apple tree as I hurried to put everything away. Of course, as soon as I had Loke jump into his spot, the rain stopped. The last matter of business for this post is to say my trike is already at the wonderful shop in Stockholm. Loke’s been a bit more lazy in the apartment today though he’s been perky enough on his walks. His feet are fine in spite of the fact his socks were ribbons and less than useless with still 6 miles to the castle. I guess I can’t really complain unless it’s about the fact I won’t be able to ride this weekend. The shop says Monday to get the proper chain ring and check the gears. Ah well.